Jeff Lemire and Ramón Pérez’s run on All-New Hawkeye has been characterized by overlapping time periods, with their first arc exploring Clint “Hawkeye” Barton’s past while their second looks at Clint and Kate “Hawkeye” Bishop’s tense relationship 30 years in the future. This story structure has given the book a different flavor than Matt Fraction and David Aja’s preceding run, but it’s still a flavor that is strongly informed by the distinct perspective of the creators. 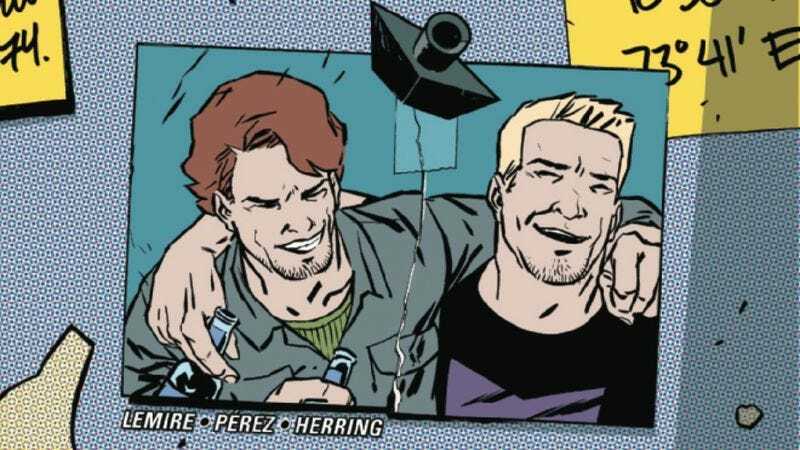 It allows Lemire to incorporate the bittersweet nostalgia that has permeated much of his work, and Pérez and colorist Ian Herring show off their versatility by changing art styles depending on the time period. This preview of next week’s All-New Hawkeye #3 highlights the distinctions between the present and future, beginning with explosive, brightly colored Clint and Kate action in the future before jumping back in time to show Kate in the muted present, waking up after a wild night. The thick inks and dull palette of the present-day give that scene a much more realistic look than the sketchier, more vibrant fight in the future, heightening the tonal contrast in the script with a pronounced visual shift.